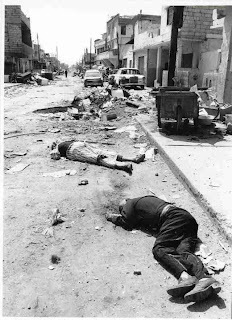 Hundreds of unarmed Palestinian and Lebanese civilians were slaughtered by Lebanese Christian Militiamen in the refugee camps of Sabra and Shatila under the watchful eyes of the Israeli Defence Forces . the context is important but the facts remain that this was a cold-blooded massacre. As far as the details are concerned much has been left to speculation and clouded in a shroud of mistery and shame. 25 years later very few are interested in finding out the truth and asking the tough questions.